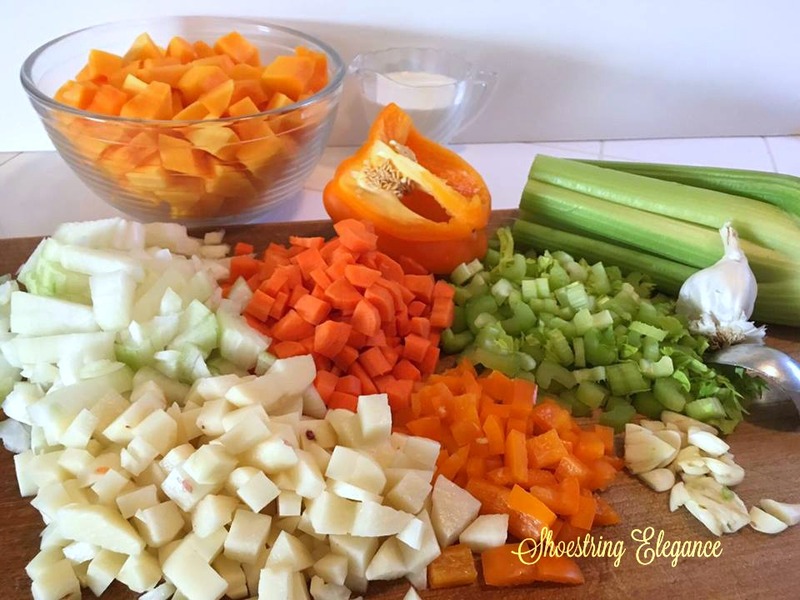 There is absolutely nothing more important than having good quality ingredients. No matter how good a recipe may be, if you don't start with quality ingredients, it won't turn out as well as you hoped for. However, with this recipe, it doesn't take much money to have quality. I shared this recipe once before on my blog, but time, experience and fine tuning, have put me in a place to better share it with you now. First of all, this past year has been full of many trials, health and otherwise, but as I say that, I can tell you they were quickly followed my miracles and abundant blessings. I can think of no better reason to get the family together to eat some wonderful soup! 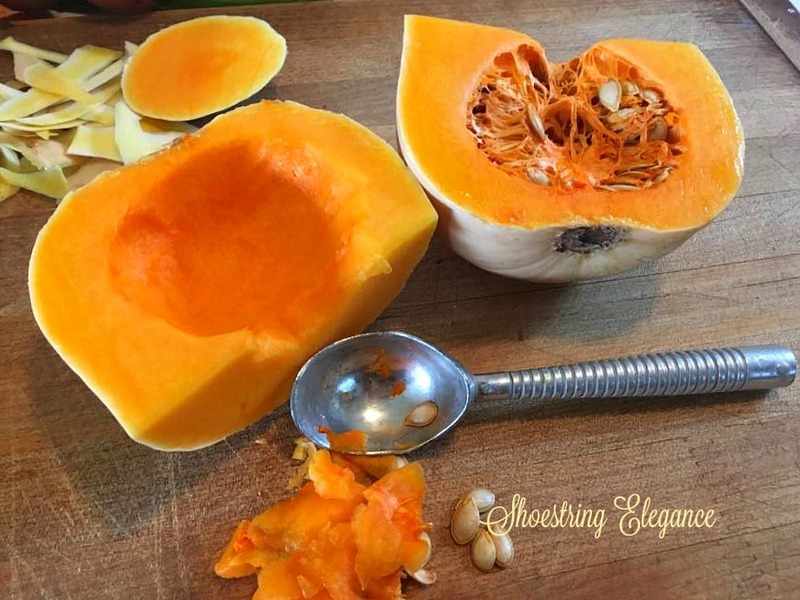 I know a great many people that find butternut squash a very daunting idea to take on, but truthfully it couldn't be easier. I use a regular T peeler and just peel mine like it were a potato, then the very best way I've found for cleaning out the center is a good old ice cream scoop, not so scary, right? 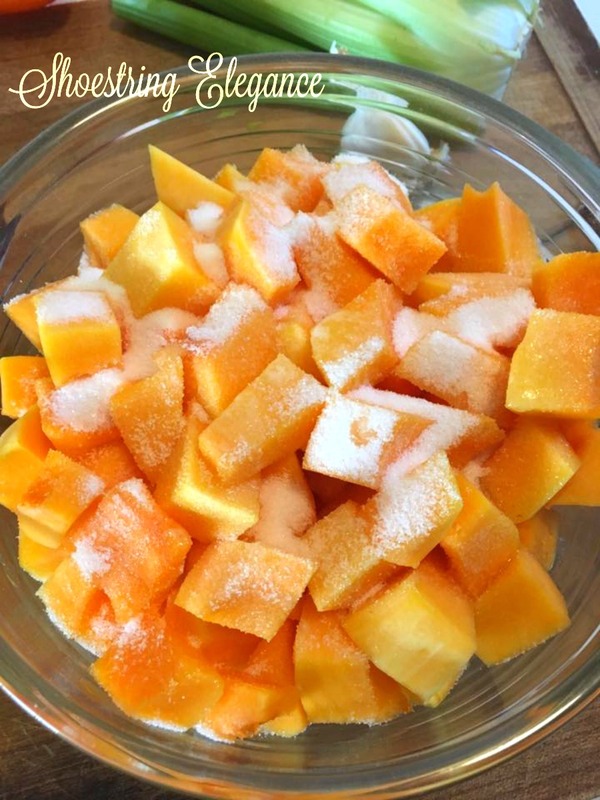 Once you have peeled and cut your squash into approximately 1-inch cubes, place them in a bowl that allows you room for folding with a spatula. You are going to want to pour 1 Tablespoon of each, butter and extra light virgin olive oil over your precious cubes and then add a tablespoon each of salt and sugar. It's really not that much when you consider that it's all going into a very large pot of soup. This combination gives you the exact balance needed to get that nice caramelization. That's the whole reason for roasting your butternut in the first place. 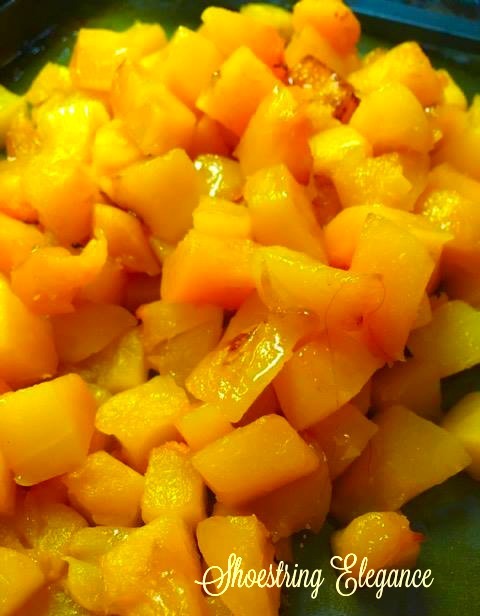 Just as you have poured your wonderful golden gems of Butternut onto a cookie sheet (lay foil over the top and push down, do not seal) and put them into your 425 degrees F oven, you are ready to toss all your other veggies into a large saucepan, with a little olive oil and salt, cover and cook on medium. The steam will be enough for the first 10 minutes. after 10 minutes add your first can of Chicken Broth (I like Swanson's) but, you should use your favorite. Just about the time your veggies start to soften (approximately 20-25 minutes) It's time to take your Butternut out of the oven and give it a turn and pop it back in, without the foil, for an extra 5-8 minutes to get just a little more of those golden edges. Note: If you are making this while your family is present, be prepared, many will not make it into your soup if you leave these little morsels unattended. When they are done they will look something like this. Now, you are ready to add your roasted squash to your veggie mixture. 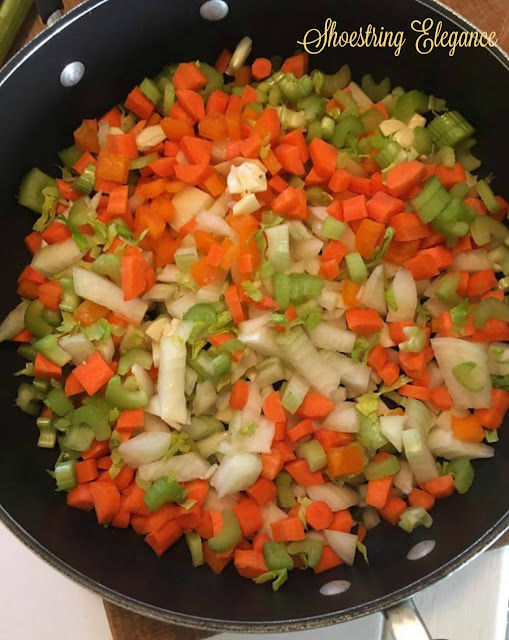 After you combine the two, add an additional can or two of the chicken broth, cover and let cook together for about 10 minutes. I take my potato masher, at this point and give it all a light mashing, reducing my heat to low. The rest is up to you! Some people like to blend the entire soup to a pure cream, I have found I prefer to blend 1/2 of the soup, adding your half and half and cream cheese, while blending. Then return it to the pan. It really is creamy, yet gives you some pleasant texture, as well. Remember when re-heating this to keep on low, after you've added the dairy, it can separate on higher heat. 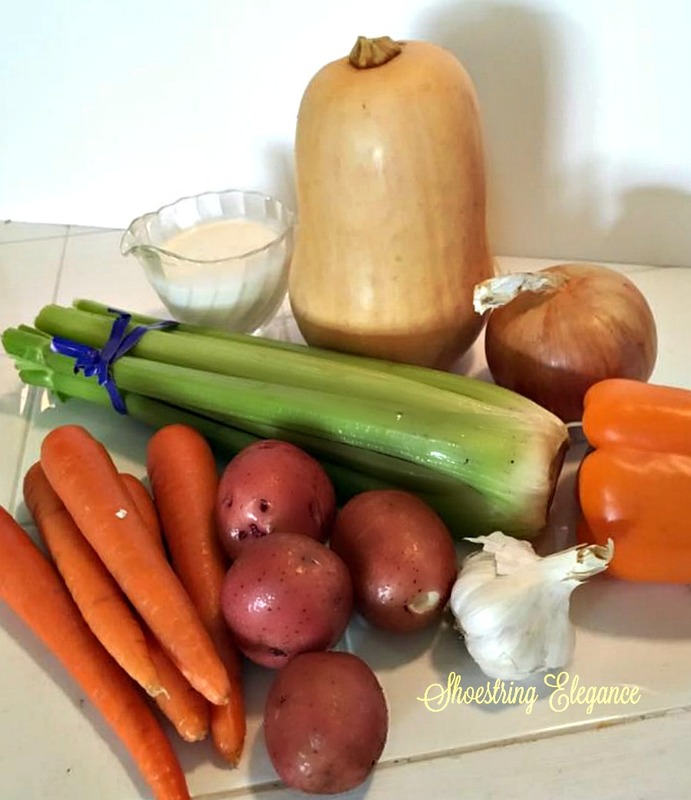 Whether you have a wonderful family to share this with or you are on your own, this is a wonderful soup, and it's just perfect for cooler days and the time to you need to think of all you have to be grateful for. I hope you enjoy it as much as my family and I do. I'm so grateful that you come over to read what I have to share with you. so, I have added you all to my gratitude list, this year, once again. I am a soup and salad lover! Can't wait to try this beautiful fall recipe! I've never had soup from squash before, but you may have made me a believer! Thanks for a yummy looking recipe! Heather, absolutely my pleasure!! To be honest, I never cared for butternut squash soup, until a few years ago, when I decided to noodle around with the old traditional recipes until I came up with this! Now, We all love it! This is very different from the typical and I think will become one of your faves! Thanks for the kind comment! 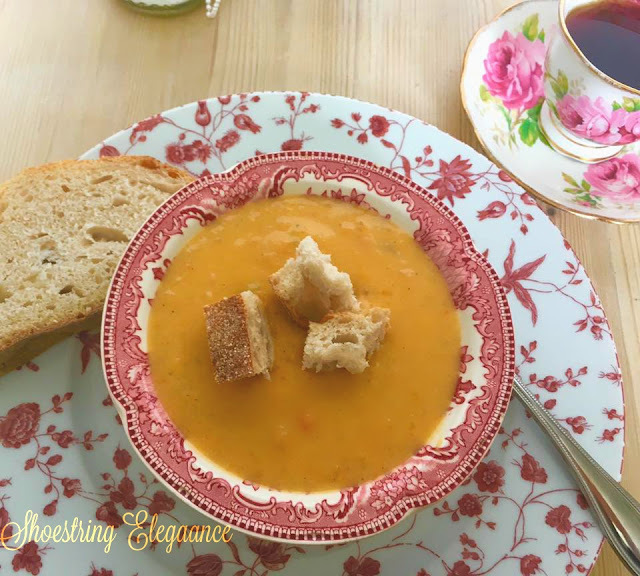 We love roasted butternut squash, so this soup sounds interesting. We can't handle the garlic, though. Do you think it will make much of a difference if we leave it out? Hi, Julie. No, not at all. I've made it several times for my Dad without the garlic. Still yummy. Let me know what you think. YUM and YUM. So glad I saw this before heading out today. Must make. Great, Marcia! I love to know how you liked it! Looks yummy. Thank you for linking up with us at #HomeMattersParty. See you again next week. 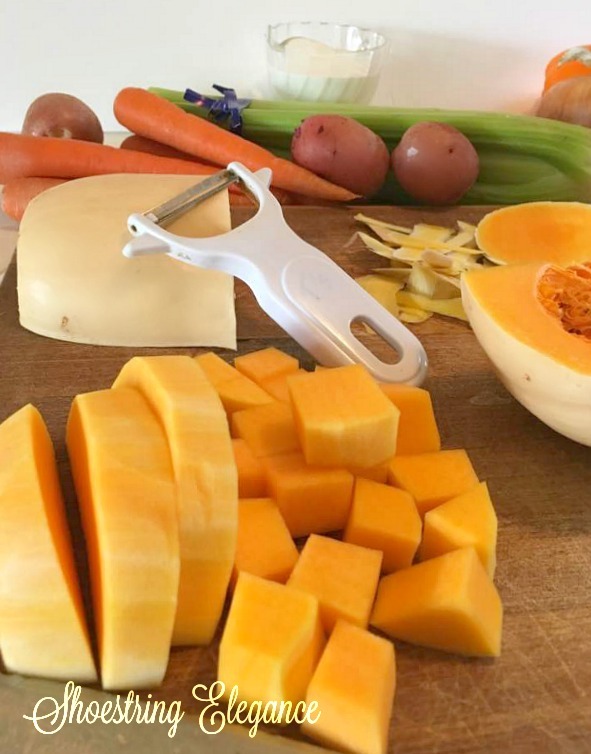 That looks so yummy, I love butternut squash soup but hadn't thought to roast mine first. I'll have to try that for sure next time, which will be soon because I have one of these beauties on my counter as we speak. Thanks for linking to Waste Not Wendesday link party! Toni, I'm so glad you stopped by! Roasting the butternut gives it this out-of-this-world caramelization that just amps up the flavor perfectly! Thanks for the Feature and for the visit! Your Roasted Butternut Squash Soup looks fantastic and it is so good to see you here again! Have a great week and hope to see you at Full Plate Thursday again real soon! Thank you Miz Helen! It's great to be back. I hope to be back to Full plate very soon. Oh I love this stuff! Your recipe looks delcious! Thank you for sharing at Home Sweet Home! Thanks for sharing this recipe with us at Monday Social. What a perfect soup for fall. Yum! This looks delicious and quite "doable." Thank you for sharing the recipe! Thanks for joining the Grace at Home party. I'm featuring you this week!